It’s always a great thing when form meets function, especially when it comes to toys. I believe that you can never start too early fostering your children’s appreciation for good design. This holiday season, escape from the licensed character and electronics overdrive of the big-box stores and instead consider well-designed, inspiring and educational gifts that you also won’t mind laying around your home. Some of the best gifts don’t involve batteries and buttons and can’t be bought in the big chain stores. I think that makes them the most special. own as well. 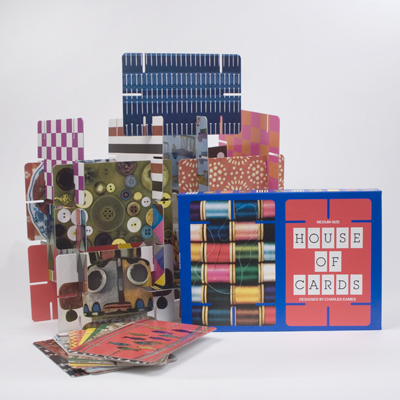 Designed by modernist legends Charles and Ray Eames, these interlocking picture cards feature vibrant photos, patterns and colors. Stack them in a tower or build a house. They come in a lovely box. $25 at the MoMa store. 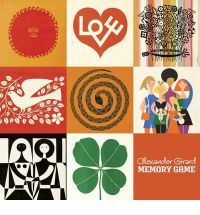 Alexander Girard Memory Game: This beautiful version of the classic children’s Memory game features the work of renowned Herman Miller textile designer Alexander Girard. Kids and adults alike will find beauty in the fun, colorful and modern designs and illustrations. $15.95 at Ammo Books. Kaleidograph: I scored one of these on Fab.com recently and it is really cool. Both of my girls (and I) love to make designs with it. 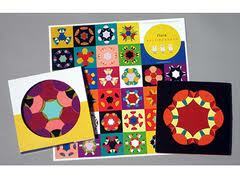 These colorful, die-cut paper cards can be arranged into more than 350 million designs, according to its makers. It’s good for the brain, the environment and the wallet and is the size of a CD case, which makes it tremendously portable. It’s a great one to throw in your purse for entertaining the kids at the restaurant or in the car. $12.99 on Amazon.com (for store availability visit Kaleidographtoy.com). Pʼkolino Book Buggee: A great way to always have their favorite books at hand, the P’kolino Book Buggee has four “V” shaped book holders and driving room for a special friend too. Bring it from room to room – it’s unique wood design and bright colors will complement any modern décor. Comes in natural, orange or school bus version. $39 at City Sprouts. 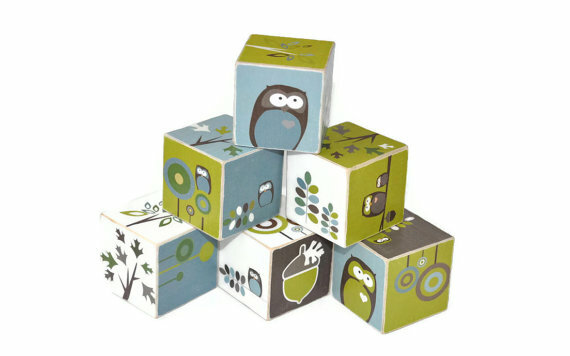 Dwell Modern Owl Wooden Blocks: I love the colors and designs on these. They are just so pretty to look at and also provide great developmental stimulation. Made of solid maple, they are eco-friendly and durable. 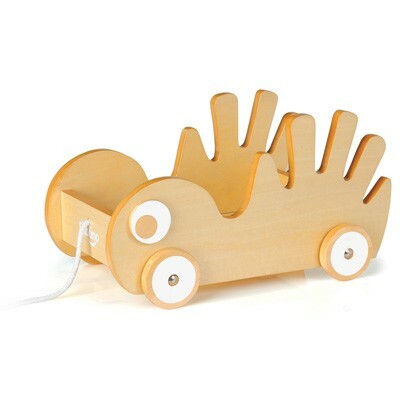 They would look adorable in just about any modern nursery, toddler room or playroom. At 1.5″ square, they also don’t pose a choking hazard, so they are safe for all ages. As a bonus, they come with a handy unbleached cotton muslin drawstring bag for easy travel. $38 at Stackblocks on Etsy. 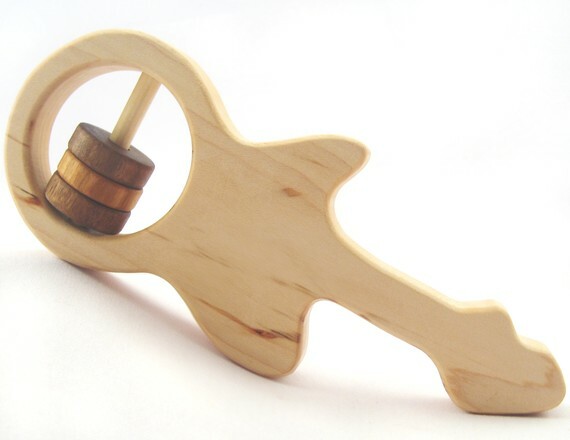 Organic Guitar Wooden Baby Rattle Teether from Smiling Tree Toys: As a music fan, I absolutely adore the guitar shape of these gorgeous rattle teethers. In fact, I adore pretty much all of the toys in this Etsy shop. 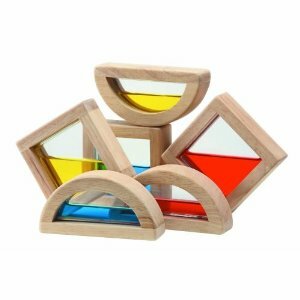 Beautifully hand-made sustainable toys made of maple and finished with a special blend of beeswax and organic camelina oil from the family’s farm. It comes in a muslin bag and can even be personalized with a gift note. These gifts also give back – the company donates to the Peace Corps’ youth education projects with every sale. $26 at Smiling Tree Toys on Etsy. LEGO Architecture, Fallingwater: Older kids, teens and even adults with an interest in architecture will love LEGO’s Architecture line, featuring models of famous architectural landmarks such as Frank Lloyd Wright’s masterpiece, Fallingwater®. The assembled Fallingwater model stands 10″ (256 mm) wide on a gray base with printed name label and includes a booklet with facts about the building, its construction and its history. Or try the Farnsworth House™ by Ludwig Mies van der Rohe. The finished models will look great on a shelf or display. Ages 16+ Fallingwater, $99.99; Farnsworth House, $59.99. Available at Lego.com. Brinca Dada modernist dollhouse and furniture: The first time I saw Brinca Dada’s Emerson House modern dollhouse, well, I wanted to move in. 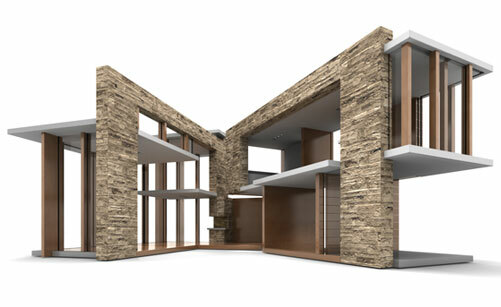 This house has everything, including sliding glass doors, mitered glass corners, solar panels and recessed lighting. It’s even eco-friendly. This is the kind of dollhouse you don’t stash in the basement or hide in the corner, no. This one you’ll happily put right in your living room. It is of course recommended for kids (or grown ups) who will take good care of it and appreciate its craftsmanship. To go with it, Brinca Dada also offers a complete line of gorgeous miniature modernist furniture. This is truly a collector’s piece. Assembly is required. Emerson House, $399 at Brinca Dada. www.brincadada.com. Modern Paper Dolls – These cool, laminated modern paper dolls come in a wide variety, and at just five bucks apiece, it makes it easy to collect them all. The beautifully patterned dresses jump out on the black silhouette dolls. They attach with heavy-duty Velcro, making them easy for even the smallest hands. Each set comes with a doll and 10 different dresses. $5 each at Hansel and Gretel Craft Shoppe on Etsy. 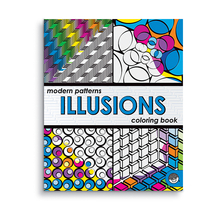 Modern Patterns Illusions Coloring Book – Regular coloring books can be so boring. These cool modern patterns are challenging and stimulating. Break out the markers, crayons or colored pencils and get creative. The book contains 12 images repeated on 23 pages. $6.95 at Mindware. Retro Barware Puts the Style in Happy Hour – I’ll Drink to That!